Game Cartridge plus Dust cover Cleaned and Tested. Label Looks great, no rental stickers. Clean cartridge. Fast shipper, 1 biz day. check out my other games. 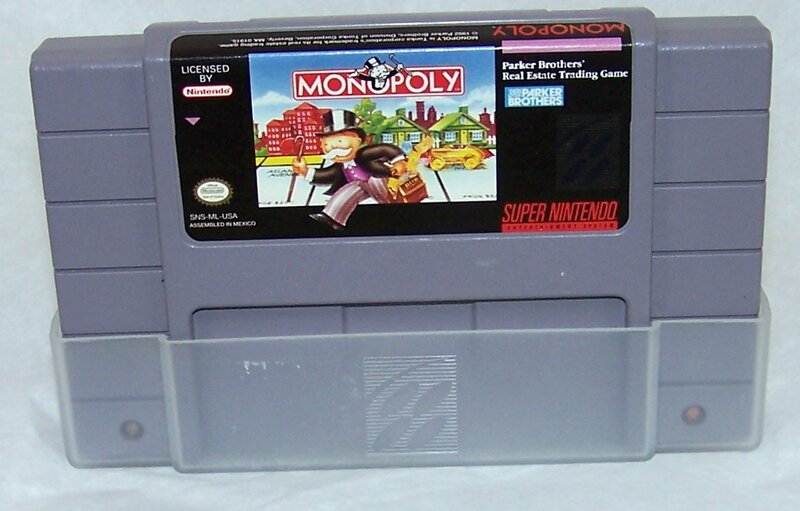 Monopoly for the Super Nintendo introduces a whole new generation to the classic board game. The object of the game is simple: bankrupt your opponents. The gameplay calls for you to roll the dice and circle the board, buy or trade properties, build houses and hotels, and charge rent when your opponents happen to land on them. The more expensive properties are more desirable, as the rent is proportionately higher. You must also avoid the long arm of the law and jail time, which causes you to lose a turn and potential profit. From the look of the board itself, to the wheelbarrow, race car, and dog used as pieces, to the color of the deeds, every detail is accounted for in the Super Nintendo version. You can play with up to eight players with a multi-tap, or go it alone against the computer. All Games Are Cleaned and Tested prior to listing. Discounts for Bulk Purchases, email for details.